Trees help build stronger neighborhoods. 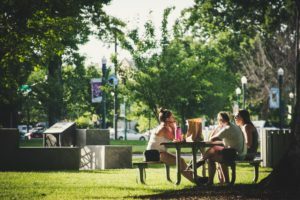 Residents in areas with more trees and other greenery know their neighbors better, socialize more often, have a stronger sense of community, and feel safer and better adjusted. Research at a large public housing facility in Chicago shows that the formation of neighborhood social ties largely depends on informal interactions that occur in common spaces. An attractive, inviting space has a positive influence on the quantity and quality of these social interactions. Improving common spaces by planting trees and other vegetation is a particularly effective tool in helping encourage these interactions and create a greater sense of community. Researchers linked social survey data with socioeconomic, neighborhood layout and green space data. They found a positive relationship between the amount of tree canopy and the amount of social capital and connection. Having access to nature and the outdoors is considered therapeutic; this is especially important for older adults. However, many of them do not use outdoor areas. One study looked at why these areas are underutilized by measuring how the landscape impacts outdoor usage. It found that older adults in assisted living facilities who have more exposure to green common spaces report a stronger sense of unity among residents within their local neighborhood. A variety of plant materials and good views were two factors that doubled their time spent outdoors. Not only increasing their socialization, but their overall health. Trees are a relatively inexpensive and easy way to enhance the strength of social ties among neighbors. April 26th is Arbor Day; get outside to plant a tree and build a community. For more information and links to published research, visit the Vibrant Cities Lab. ← Figuring out what tree to plant this spring?